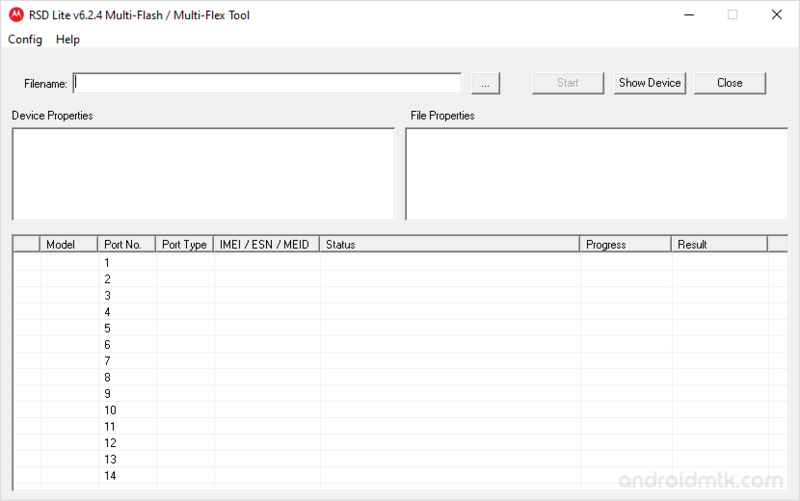 RSD Lite Tool is the official Tool created by the Motorola Mobility LLC, which helps you to flash the Stock Firmware (ROM) on Motorola Smartphone and Tablets. Here on this page, we have managed to share the latest version of RSD Lite Tool along with the previous versions. It comes with the simple user interface which helps users to easily perform the flashing or installing the firmware on the Motorola Devices. On the Top it let you choose the Stock Firmware, and in between it shows the information of the connected device including the Model Number, Port Number, Port type, IMEI, ESN, MEID number, Status and progress. It allows you to flash the Stock Firmware (Flash File) on your Motorola Smartphone, Tablets, Feature Phone and Smartwatch. All you need to have the correct firmware of your device and you have to load the firmware in the tool and you are ready to flash it in no time. It support flashing various firmware formats including xml, shx, sbf, hs, hsx, zip, bzip, gz, tgz, bz2, tbz2. All the latest Motorola Devices with the XML based firmware which can be flashed easily with the RSD Tool. It comes with various config options including Flash Flex Options, UID Options, Image File Options, Flash Modes, Switch to MTk Download. The Flash options helps you to choose ODM Serial, Restart after Flexing, TI Blank Flash. By using the following links, you can download the official RSD Lite Tool on your Computer. We always recommend you to use the latest version of the tool for stability. [*] Compatibility: RSD Lite Application is Compatible with Windows XP, Vista, Windows 7, Windows 8, Windows 8.1 and Windows 10 (x86 or x64 bit). [*] How to use: If you want to learn to use RSD Lite Tool then head over to How to use RSD Lite Tool page. [*] Credits: RSD Lite Application is officially created by Motorola Mobility LLC. So, full credits goes to them for sharing the application for free.